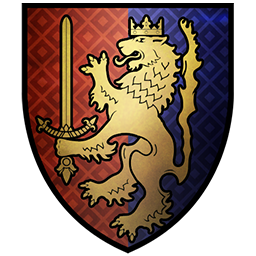 King Louen Leoncoeur – ‘the Lionhearted’ – is the current King of Bretonnia, having ascended to the throne following a unanimous vote of his peers and with the consent of the Fay Enchantress, the earthly representative of the blessed Lady of the Lake. It is this approval that means the most to Louen, for in years past he completed a Grail Quest, expelling evil from Bretonnian lands before supping from the mystical chalice and receiving the Lady’s blessing. From his capital at Couronne, the King rules wisely and with an even-hand when dealing with Knight or noble alike. Fairness in all matters is his watchword, never allowing the law as written to compromise its noble intent, never refusing anyone – peasants excepted of course – a hearing in his presence to air grievances of which he must be the judge. So great is Louen’s statecraft and mastery of diplomacy that many consider him to be not just the natural successor of Gilles the Uniter, but believe he is descended from the same noble bloodline. On the battlefield, Louen is a deadly adversary, a natural general, and the Lady’s chosen champion – leading the Knights of Bretonnia into the fray upon his noble Hippogryph, Beaquis, and smiting evil wherever he finds it. Somehow, the King has halted the aging process, appearing to be a much younger man than his birth records belie; maybe it is the Lady’s favour, her eternal blessings – or even her ethereal kiss – that enables Louen to hold back the advancing years and continue to lead his kingdom to glory? For glory is at hand – the time has come for Bretonnians to rally under King Louen’s banner and, with the blessing of the Lady and the protection of the Fay Enchantress, march on dark, corrupted Mousillon and bring it back under control once and for all! Total War: Shogun 2 Updated! !